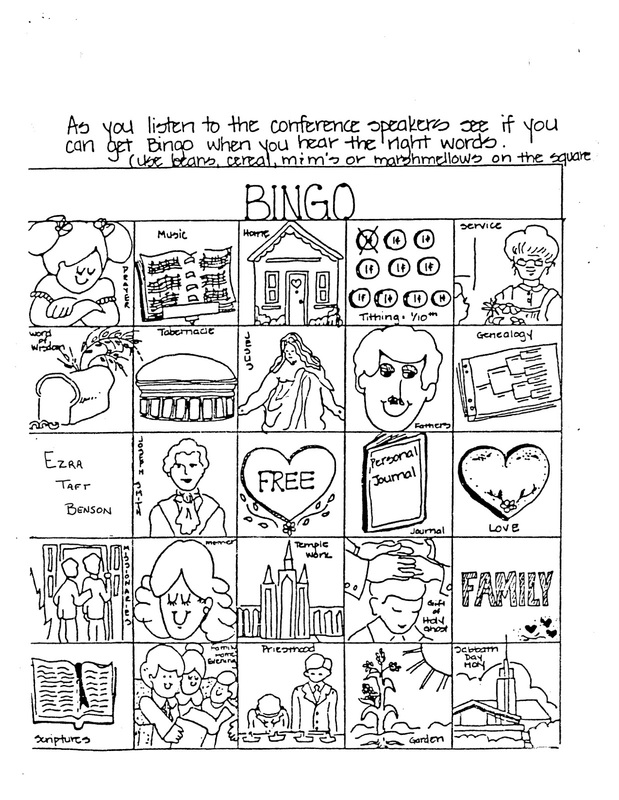 When we were growing up, we had a little game we played during General Conference. We always used Skittles to mark the things we heard…..
Well, last week I had some time on my hands, and I thought it would be fun to make a new one. I kept everything black and white so that kids could color the pictures if they wanted. The pictures make this BINGO game perfect for younger children to play along too. Feel free to download it, print it out, and try it this weekend! 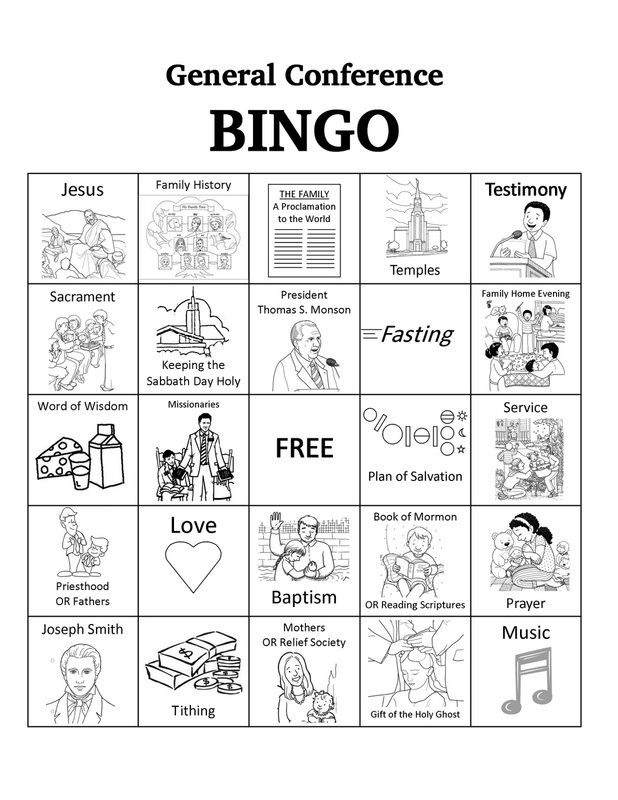 *UPDATE* We have made more BINGO sheets! I love it! Thanks! I’ve always wanted to get the bingo card we played as kids. This is even better. Thanks for doing it. Ashlee, this is a great idea. I want to eat skittles during conference too! 🙂 My kids will love playing bingo! Thank you!! It’s so nice to have help keeping the kids entertained so we can all listen. What a great idea, Ash! Caden will love this! Thanks for making this! My kids will love it! do all the kids use the same print out? so they all win at the same time? I haven’t played bingo in a long time! Thanks for sharing! My kids loved it! Thanks so much! We usually get a packet form Grandma but didn’t this year, so this has been so helpful! This is my first time trying something like this. Thank you for sharing your genius ideas. How do you print this. I mean, how can I print this? It is not my first time to pay a quick visit this site, i am browsing this site dailly and take pleasant information from here all the time. do i print the same one 4 times or something else? Thank you very very much. We have many many new converts in our area, primarily from Nigeria. 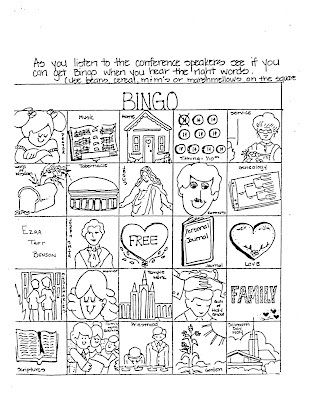 We are planning to color these and prepare General Conference Bingo kits as part of our RS Anniversary Celebration to give to the new families to use with their kids for General Conference a few weeks later.